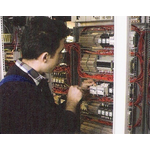 Hakan Elektrik is active in automation system design and construction since 1995. At that time the company was mainly engaged in establishing electrical infrastructure on container ships. The company designs and installs various components of the systems used in all sea vessels in a customized manner through creating a standard of no-man-engine compartment, where a complete automation of electrical component within the ships is achieved. These systems include navigation light control, general alarm, watch dog systems and more. In addition to these, scenario design and application to all type hydraulic systems by PLC and load management system up to 4 generators with all functions can be implemented by the Turkish company. Hakan Elektrik is active in automation systems design and construction and would like to be an outsourcer of shipbuilding yards in the context of electric ware dressing and electrical infrastructure construction and modernization. The company is especially experienced in electrical works of mega yachts and already equipped 29 mega yacht projects with electric ware together with project and material work. The company would like to be an outsourcer of shipbuilding yards in the context of electric ware dressing and electrical infrastructure construction and modernization. The potential partner is expected to employ the Turkish company as outsourcer in mega yacht building projects. Hakan Elektrik is active in the fields of all kinds of automation systems, and generator synchronization systems has developed an alarm monitoring and control system, one of the main systems used in all sea vessels, at a standard of unmanned engine compartment with a totally customer oriented approach by getting the approval of ABS Lloyd. The main purpose of the system is to give ship's officers all the basic alarm and status information they require to maintain safe and efficient operation of the machinery and other related equipment. The system enables monitoring and controlling all the alarm systems on board from vessel as well as from a distant place via Ethernet connection. In addition, the system keeps and displays all status changes for history recording. Hakan Elektrik is experienced in equipping mega yachts with electric ware has developed an alarm monitoring and control system that enables monitoring and controlling all the alarm systems on board from vessel as well as from a distant place via Ethernet connection. The company is seeking commercial agreement with technical assistance with yacht building ship yards and yacht owners to setup and implement this highly customized system.